Celtic will be keeping a very close eye on how things develop at Anfield tomorrow night. 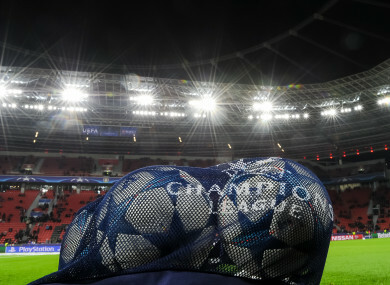 THERE’S JUST ONE more evening of football before we know the identity of all 32 teams that will take their places in the group stages of this year’s Uefa Champions League. The draw takes place in Monaco on Thursday morning. And regarding tomorrow night’s fixtures, there’s one big question that remains unanswered: what pot will Celtic be drawn in? But Brendan Rodgers’ side are used to being the fourth seeds in a four-team group. However, they’ll be keeping a very close eye on what happens on Wednesday night at Anfield. Because, should Liverpool be eliminated at the hands of Bundesliga side Hoffenheim (the tie is currently 2-1 in the Reds’ favour), it means the Scottish giants will be drawn from Pot 3 and, in theory, get a more favourable draw. Should Jurgen Klopp’s side progress, Celtic will drop to Pot 4 and face a pretty daunting task of getting out of their group or even making it into the Europa League. Email “As it stands: how the Champions League group-stage draw is shaping up ”. Feedback on “As it stands: how the Champions League group-stage draw is shaping up ”.